It's 10:55 in Matre, Norway right now. Traffic F381 (Stordalen) A view of the current traffic situation. 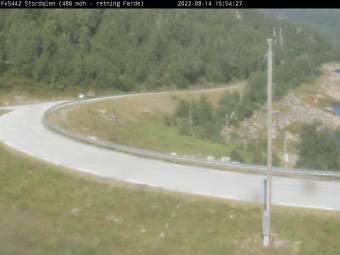 Romarheim: Traffic E39 (Romarheimsdalen), 9.5 miles away. Trælland: Traffic F57 (Marås), 17.4 miles away. Evanger: Traffic E16 (Evanger aust), 23.4 miles away. Blinde: Traffic F00 (Blindheim), 28.5 miles away. Åsane: Traffic E39 (Vågsbotn), 28.5 miles away. Senneset: Traffic E39 (Aarbergsdalen), 30 miles away. Herheim: Traffic E16 (Vinje), 30.9 miles away. Holdhus: Traffic F7 (Gullbotn), 32.4 miles away.